Another day, another bet on sea ice. A few days ago, a regular reader of HT emailed to ask me if I could provide some support in a long series of comments to a post at Poneke! about the showing of Swindle. So I did (my contributions start here). And now I have another bet on this northern hemisphere summer’s sea ice minimum, with a commenter calling himself “malcolm” taking the Stoat position (cold side = more ice than last year, not something out of the Kama Sutra). So here’s an update on events up North. Consider it a form guide, if you will. Andy Revkin at Dot Earth kicks things off with a post drawing attention to a new study canvassing the views of 19 teams working on climate change in the Arctic. 14 offered numerical projections, and 11 of those expect this year’s minimum to be similar to or below last year’s record. The new Study of Environmental Arctic Change (SEARCH) programme has just produced its first monthly report. I confidently predict that these reports are going to be required reading as the melt season progresses. If you click on the “Full report” tab you can read comments from the individual submissions (which are all available for download). So, what does this do to the odds? Five teams expect a significant new record, six are clustered around the same amount as last year (three above, three below), and three expect some rebound back towards the longer term trend. My original estimate in September last year (see first comment) was that the odds were 50/50 on a new record. I think that’s still broadly true, though the cold side odds look to be lengthening as observations come in. Meanwhile, a commenter at Dot Earth drew my attention to an interesting graph of sea ice extent produced in Japan. This shows the same sort of curve as is available at Cryosphere Today, but usefully overlays the last six seasons information (easier to track on the full size image). What you can see here is that the extents are all very bunched together in May and June, but begin to diverge in July. 2006, for example, tracks well below the previous record year (2005) until slowing down in July enough to get back above the line, and eventually fail to reach a new record. 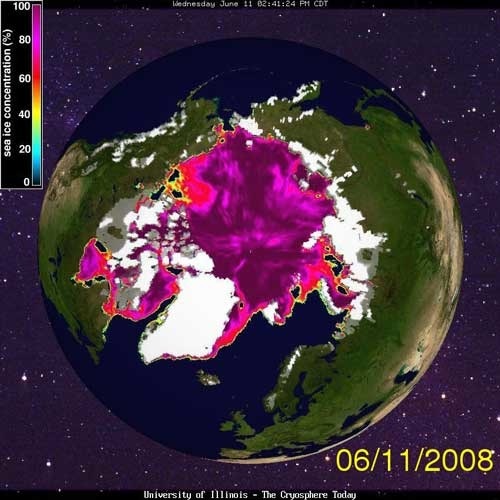 In 2007, the July melt was (as some Arctic researchers have noted) remarkable. The next six weeks are therefore going to be very interesting. A cold July could be enough to prevent a new record. But the ice pack is “conditioned” for a big melt by the much smaller amount of multi-year ice. Two say will, two say won’t. My gut feeling? I’ll be sending my winnings to Oxfam. For completists, here’s another view of the current sea ice extent from the State of the Canadian Cryosphere site, which uses somewhat more tasteful colours than CT.
Also link-mined from Revkin, I offer the truly amazing Extreme Ice Survey site. The pictures are wonderful, and include time lapse sequences of Greenland glaciers calving. It’s a Flash site, so I can’t link to individual bits: try clicking on “evidence” in the top nav bar, and then look at the videos. Remarkable. Finally, what might turn out to be the first of a flurry of papers that look at the impacts of rapid Arctic sea ice loss on climate change in the Arctic [Physorg]. “Our study suggests that, if sea-ice continues to contract rapidly over the next several years, Arctic land warming and permafrost thaw are likely to accelerate,” says lead author David Lawrence of NCAR. Remember my recent post about methane? It’s exciting alright. Every day, I visit Cryosphere Today and NSIDC to look at the maps and the anomaly, and wait patiently for the latest GisTemp maps (so I can compare 07-08 arctic temperatures). I can imagine it would be even more exciting with money on it. So far, it looks like you’re on the money. The polynas are larger than in previous years, so more heat transfer, and more melt. Fun for the casual observer! Just wait until the permafrost starts properly melting… want to start a betting pool on methane emissions ;)? ..want to start a betting pool on methane emissions ;)? Go Gareth. Actually I am very torn about who I want to win this one. Malcolm, I guess, for a less gloomy outlook. Those are some nice links, Gareth! I’m going to be watching the melt season up north pretty closely too. I feel like a bit of a slow-motion storm chaser, but we are more-than-likely witnessing some pretty major large-scale changes. Confirming the bet Gareth, as requested, although I’ll decline the “climate crank” sobriquet. The loser writes a cheque to the winner’s charity. And as for runaway methane emissions from the permafrost – the question I would ask is: why didn’t they occur in cases of natural climate variability over the last few thousand years? It’s been a long time, and a lot of temperature variation, since the start of the Holocene. But more generally – thanks for being a good sport, and here’s to constructive argument and testable prediction. If you are right, I’ll regard that as significant evidence of substantial global warming, and give a small tick to the AGW hypothesis as well. Lordy Gareth, you’ve got more patience than me. That guy you’ve taken the bet with was going on about how the statistics were being abused because of the zero point (news flash: it’s arbitrary and doesn’t matter), that the UAH signal has peiodicity (hell if he can demonstrate that those ENSO-related variations have a predictable cycle he’s got a ground-breaking paper), then linking to graphs that obfuscate the trends in the data by choosing ludicrous scales on the axes… well you’re a better man than I for keeping going with the discussion. Was there methane outgassing during the Holocene climatic optimum? Probably. But temperatures have already passed that point, and are heading upwards. If the sea ice retreats further, the Arctic warming that will result will be very bad news for permafrost and clathrates. And fragment: sometimes it’s worth going the extra mile… But only sometimes. i.e. in winter. The calculations by Vinnikov et al. (1999) and Manabe et al. So, there ‘might’ be global warming leading to a reduction in year-to-year ice, but the cause has got to be solar. Solar-dominant forcing would be at its peak in the summer, and zero in the Arctic winter. Indeed, we see winter ice okay, summer ice not okay. Conclusion: The Sun. William, hope is eternal in spring (or however that goes). But summer is almost here (or there, strictly speaking, as this is on an SH server). So, Harry, you’re good for Gareth’s bet? Malcolm, during the mid-Holocene there was high-latitude warming due to orbital variations (Milankovitch cycles), which as Gareth notes has already been exceeded by the present warming. What’s different now is that we have direct atmospheric and surface warming from CO2 and soot, *plus* encroaching warm currents from the south. This latter effect is what’s getting the ice, i.e. largely it’s melting from underneath. Another effect is that the Arctic Oscillation (apparently also connected to AGW, although less onviously so than the currents) has been pushing older, thicker ice into the Atlantic. Cloud conditions too have been favorable for melting, which is also related to the shift in the AO. Re the methane, I’m actually more worried about those warm currents due to the 150 Gt of methane locked up in very shallow clathrate deposits on the East Siberian Shelf. This is less than on land, but it seems obvious that it could melt much more rapidly. So what do you think of my theory? If it was caused by warming then we’d see winter ice extent reduced. But we don’t, only summer. Unfortunately for your theory, Harry, the winter maximum has been in decline – see the NSIDC graph here. Plus the extent/area doesn’t tell us anything about the thickness of the ice, and that has decreased markedly. There’s also been a huge reduction in multi-year ice. Steve outlines the main contributors to the Arctic heat budget. They’re all working together to heat the place up. The sun has a role to play, but it does the same thing every year. It’s the changes in the oceans and atmosphere that make the difference. There you can compare various years and areas. Hint, if this year is going to be a bigger drop than last year, the minima will be set in the areas Hi East Arctic, and Hi West Arctic 1 & 2. If anyone wants I can go over that. “Information about the average thickness of ice before the advent of nuclear submarines is limited to occasional samples taken from ships and manned ice camps. They suggest an average thickness of 3 to 3.5 meters and LITTLE CHANGE IN TIME. Declassified submarine sonar observations of the ice draft taken between 1958 and 1976 corroborate this information. 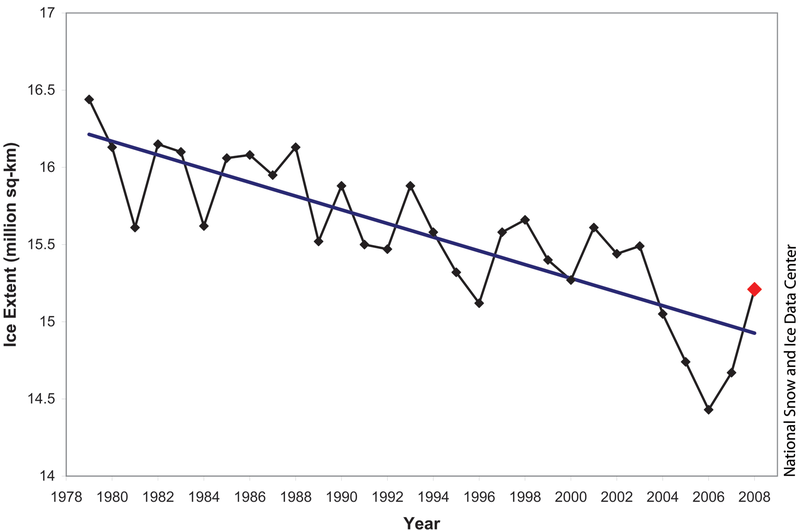 However, the unclassified cruises of the SCICEX program, 1993â€“199t show a significant, locally variable, thinning of the ice by 1â€“2 meters (Rothrock et al., 2000). ie. no evidence of a thinning in the 1930s comparable to now, the thinning started in the 2 decades of the 20th century. Overpeck states no evidence of seasonally ice free arctic for 800k years. The ice is retreating well ahead of “modelled schedule”, in 2000 that was not clear, by 2006 it was, 2007 confounded even that trend. That Vinnikov and Manabe found the models reflected winter changes supports consensus science – the modelling accurately reflects outgoing longwave radiation(OLR). In the Arctic winter OLR is the dominant factor. Accurate handling of OLR is what we need to be sure they’re at least giving us the lowest warming (only atmospheric feedbacks) from CO2 emissions. The ice is a lot more sensitive than was thought(that paper’s 2000, it’s now 2008). This is in line with the recent reasoning of Hansen in for example “Trace Gasses and Climate Change”. There is no evidence of a direct solar impact affecting arctic ice in the last 2 decades of the 20th century. What variation of solar radiation at the surface there was in that period is due to anthropogenic aerosol changes. Such variations not feasibly the cause of the observed global warming in that period (Wild 2006). Have you read Archer’s paper on Methane as a chronic not acute issue? My concern about the clathrates is that there will be so much hysterysis with the loss of Arctic ice (also heating in the pipeline) that effectively it guarantees the release of substantial amounts of the methane. But I don’t think it will be fast and catastrophic in terms of rate of release, not on human timescales at least. Wasn’t 2007 melting in fact caused by the jet stream moving southward, allowing clearer skies over the Arctic, thus solar warming? Given that, I’m willing to bet that we won’t see a drop this year. We’ll soon know. Latest from NSIDC on Arctic sea ice is up. Extent is close to 2007, and the average June extent is close to the decreasing trend for all Junes. The question is whether this July will see the rapid drop that happened in 2007. I suppose that will depend on a number of factors, but take a look at the graphic of surface melt onset… sobering stuff. A lot of that ice is only a year old. New post comin’ up, f.
You posted here first, true, but I emailed a few people about it first thing this morning, and then had to go out. This page at the Pew Centre in the US has an overview on the global position, and here’s where you get the NZ info (download the pdf at left for the full details).